Mumbai: Tata Power, India’s largest integrated power company, has always been a frontrunner for its exemplary performances across its verticals and locations. The company has always laid special emphasis on skill development of its communities for their holistic development. The company, over the years, has worked closely with its communities to ensure adequate training being provided to the youth of its communities for a brighter future. 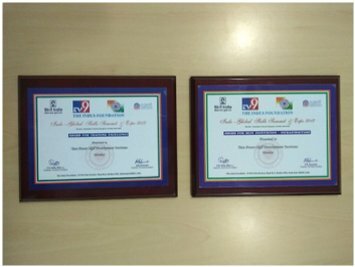 In recognition of the efforts, Tata Power skill development institute has been bestowed with two awards: Best Infrastructure and Training Excellence at the Global Skill Summit and Expo 2017. TPSDI utilised the opportunity of participation at the Indo Global Skill Summit and Expo 2017 by putting up an information kiosk, which provided an excellent opportunity to interact with prospective trainees and educational institutes such as ITIs and engineering colleges. The initiative paid dividends as the interactions paved way for several institutes to visit TPSDI training centres in Mumbai. The Indo Global Skill Summit and Expo 2017 is organised by the Indus Foundation, which is a not-for-profit trust dedicated to the promotion of higher education in India. The Indus foundation is dedicated to assist institutions, including industrial training institutes, polytechnics, community colleges, technical colleges, vocational colleges, corporate trainers and skill providers in recruiting students and career aspirants.